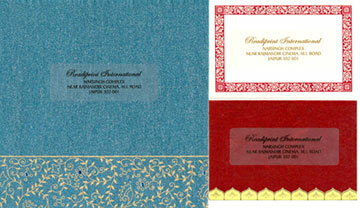 Get your Guest names and address printed individually on each envelop. This is printed in the style that you have chosen to print your text. Everything matching! All you need is send us the word file with the guest names and addresses and we will do the rest. Mention your choice. Address Label with Guest name and Address in Hot foil printing. You have choice of transparent labels or matching non transparent labels.